The Hall of Fame running back for the Los Angeles Rams, Indianapolis Colts, Los Angeles Raiders, and Atlanta Falcons is regarded as one of the greatest players in the history of the NFL. Becoming a superstar in college while at SMU running alongside his “Pony Express” teammate Craig James, Dickerson amassed over 4,400 yeards rushing in his NCAA career. The tall, lightning-fast tailback finished his career third in the Heisman vote behind Hershel Walker and John Elway and set numerous school and conference records that still stand today. Selected second overall in the famous 1983 NFL Draft by the Los Angeles Rams, #29 became an immediate success establishing rookie records for most rushing attempts (390), most rushing yards gained (1,808) and most touchdowns rushing (18), including another two receiving touchdowns. His efforts earned him All-Pro, Pro Bowl, Player of the Year and Rookie of The Year honors. In his second season, Dickerson continued his onslaught on the NFL record book becoming a member of the 2,000 yard rushing club. Twelve times in 1984 he gained more than 100 yards rushing, breaking the record of 100-yard games in a season held by OJ Simpson. His 2,105 total yards rushing beat Simpson’s 1973 NFL season record of 2,003 yards (Dickerson having reached 2,007 yards after 15 games), but since the NFL expanded the regular season from 14 to 16 games in 1978, Dickerson had the benefit of playing in two additional games. No one has since rushed for more yards in a single NFL season. 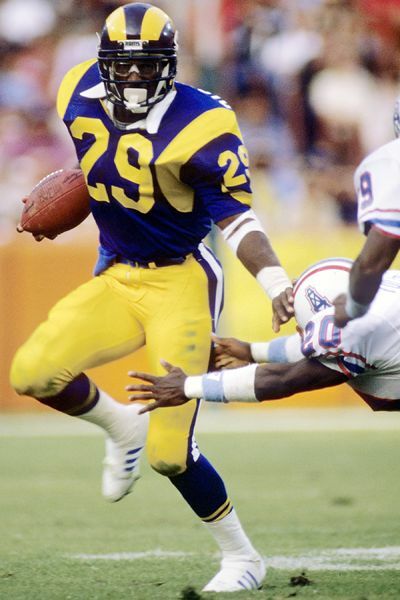 Dickerson’s 5.6 yards per carry led the Rams to a playoff berth in 1984. In 1987, after playing just three games for the Rams during the strike-shortened 1987 season, Dickerson was traded to the Colts in one of the NFL’s biggest trades ever at that time. Although he played in just nine games with the Colts that year, he still managed to gain 1,011 yards to finish the season with 1,288. As a result of his spectacular play, he spearheaded a late season Colts run that helped the team to their first winning season (and first playoff berth) in 10 years. In April 1992 Dickerson was traded from the Colts to LA Raiders for their fourth and eighth round picks in the 1992 draft. After establishing several more career highlights and continuing his steller career carrying the rock, the leading half of the “Pony Express” was dealt to the Atlanta Falcons. Playing for his forth team, Eric finished his Hall Of Fame career holding numerous records including becoming the fastest player to reach 10,000 yards (91 games) and holding the rookie rushing record. Dickerson lead the NFL in rushing four times, was a six time Pro Bowler and five time All Pro who was enshrined in Canton in 1999.